Take your car to a hand car wash with those pressure washing wands. Clean that up and drive around after. Then take another picture. X ray of the weld will show what's going on. Rock the car side to side. If it sounds like an old spring box mattress then your next step is to look at the ball joints: 6 in front (3 left, 3 right) and 4 rear (1upper and 1 lower on each side). Sounds like a slipping torque converter. To be sure, try Wide Open Throttle at the first sign of slipping. Also, try manually selecting gears through the acceleration. I think if your negative cable was in such poor condition, it stands to reason your positive cable is no good either. Could be the Ignition Coil again, check it. Never assume a system is functional on the basis the lart was recently replaced. Could be battery connections: pos or neg. Could be fuel filter or pump, measure line pressure. Could be many things, these are just the ones I came up with off the top of my head. Sounds like you forgot how hot the car runs, it's been 8 months. But keep an eye on that temp gauge and remember never to operate the motor when the temp exceeds 3/4 (I'm helping a guy cope with the results of repeatedly driving with the temp gauge pegged out: warped head). Check the tension of all your belts; then make sure the power steering, A/C, and alternator spin freely. It's been my experience that those marks in your pictures are close enough. I've tried to get all marks dead on and it always seems like there's one tooth on the timing belt that gets in the way. My guess is that honda toyota gm acura etc would have a more precise way of setting the cam and crank had it been necessary to get it dead on. The only timing related component with the ability to make fine adjustments (from the factory) on your vintage* of Honda is the distributor. 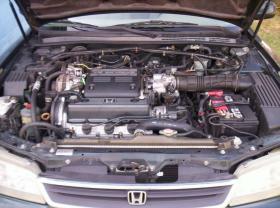 *After '95 there is no fine adjustment since OBD-2a uses a "floating" timing advance and a non-aadjustable distributor. I dunno, check the transmission throttle valve for slack? Valve spring has nothing to do with it, though removing the spark plugs does help. Other than that, you got it right. Now do work. Is the 3rd cylinder even firing? Pull codes for the CEL. Re-bleed the cooling system. 3rd cylinder is full of oil? Burning it? Huge smoke clouds from the tail pipe? Nothing special I can think of to check, above and beyond the usual. Put it like you have in photo #2. Then take the timing belt off, put all the marks where they're supposed to be: cam and crank. Then reinstall the belt and give the motor a few turns by hand. Bring it back to TDC and make sure all the marks still line up. Then you're good. Edit: if the marks are off after afew turns, it means you had too much slack in the belt. Reinstall like I described above and this time double check the tension. Looks like your timing is just a bit off. The cam is retarded just a bit when the crankshaft is at TDC. By how much exactly is hard to tell but it might be 3 or 4 teeth by the look of the photo. It is by however many teeth between that bottom mark and its correct position when the crank is at TDC, cf your second photo. LOL jeffy, he did what you described before posting. Did you even read the first post?! Okay, you seem to know the answer or it's staring you in the face and you still don't see it. The point of setting it to TDC before you start is to cut down on the work of setting it to TDC before you install the timing belt. Yes, you should be fine if nothing moved. Something moved because it won't start, and that's your proof something moved. That or you forgot to connect something. Check to see if everything is at TDC, if not the remove thebelt aand try again. If all is kosher then find what you forgot to connect. I didn't reply because he didn't say which she had. It could be an H23 or an OBD2b F23, the latter of which could be problematic. Could be? That's the point of the wet test: dry compression below spec could be compression rings or valves. Compression rings can make a better albeit still of spec seal with the cylinder wall when wet, hence following up a failed dry test with a wet test. Now to your question. IMHO, to repair head damage requires too many machine shop tools. I've tried to repair/inspect Toyota 4AGE heads and while I learned a lot about how they worked, I also learned it's more often than not better to just: pull the head, identify damaged areas (warped surfaces, bent valves, protracted detonation, etc), and then take it to the machine shop and let them rebuild it. Even a poor man's rebuild you have to seat the valves, might as well let the pros put the head on their machine and mill a 5 angle job. Edit: the only way a wet test would prove inconclusive is if the piston is found to not be moving up and down. Drop a socket extension down the spark plug tube hole and turn the motor crank by hand to see if the piston is moving. 1992 Honda Prelude Si needing advice! Just fix what you have and get back on the road. Get another motor and build it up for turbo, then swap it in. Could be: tires, balance, alignment, brakes. Car won't start while engine is cold. Make a Photobucket account, upload pics, post linkzs with tags. Well, awd crx has been done but not with a wrx drivetrain without chopping it to bits. The one I saw used the crv drivetrain on a crx delsol, not the 500hp beast you may have in mind; and like I said before, the chopped up wrx was Frankensteined with an eg civic. 500hp on a budget would be mustang country, this sounds like you. You ready to handle 500hp? LOL look up burn out fail or street race fail. Don't be one of those douchebag street racers. Have fun. Neither. For a race application the chassis needs more support (for adding the awd or I6 FR configuration) and that added weight negates any performance gained by the drivetrain selection. For exhibition only, I would pick the one you want. If your ultimate goal is racing, and you would prefer to work with either of those drivetrains, my suggestion is buy the car they came in and build that car up for your application and driving needs.